A simple, 100% natural, antioxidant, grape seed extract ointment that may assist with skin lesions and abnormal skin. A totally natural honey based (thick sticky) ointment that may assist with skin lesions, growths, and abnormal skin. This is a gentle product, it contains absolutely no chemicals and is a non-invasive approach that may assist with skin lesions like actinic keratosis (scaly areas of skin damage), moles, warts, skin tags and lichen sclerosus (sclerosis). 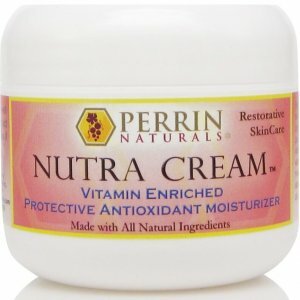 Perrin’s Blend is a 100% natural, antioxidant, grape seed extract ointment. It contains 5 simple yet powerful ingredients in a base of honey and grape seed oil. Grape Seed Extract contains polyphenols that work to promote healthy cell growth. These polyphenols have been shown to minimise the growth of abnormal cells and encourage these cells to die. Ascorbic Acid (Vitamin C) is an antibacterial, antiviral, antioxidant that promotes the growth of normal skin. N-Acetyl Cysteine is an amino acid that may help to block the development of abnormal cells. Alpha Lipoic Acid is a powerful antioxidant that has been shown to reduce the oxidation that causes aging. Oxidation, also known as free-radical damage, is caused by exposure to the sun, air pollution, heavy metals and other toxins. D Alpha tocopherol otherwise known as Vitamin E is an antioxidant shown to support healthy skin growth. Perrin’s Blend needs to be covered with a bandage to prevent it from rubbing off and staining clothes or bedding. 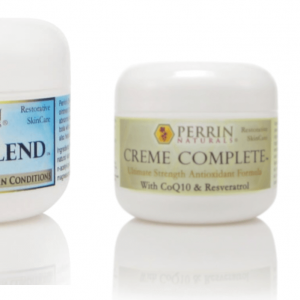 You will get best results when the area being treated is in constant contact with Perrin’s Blend. You will get faster results if the area remains covered when bathing to prevent the ointment being washed off on a microscopic level. Change the bandage after bathing and applying a fresh amount of Perrin’s Blend – avoid having a wet bandage on your skin. Waterproof plasters are a good option as they do not need to be changed as often. Wash the area periodically to prevent a build up of adhesive. If a growth is on your face then during the day it may not be necessary to cover the area since the Perrin’s Blend will probably not be rubbed off as easily. 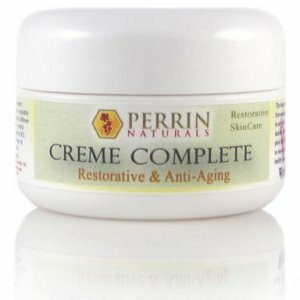 You can use Perrin’s Blend at night and the Crème Complete during the day. This is especially useful if the area is on your face and you feel uncomfortable wearing a plaster. It is also the recommended practice for Lichen sclerosus. 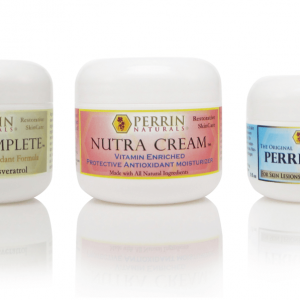 Perrin’s Blend is a natural blend of powerful antioxidants. Every single ingredient in Perrin’s Blend can be internally so you know that it’s pure and totally natural. Made with Raw Honey purchased directly from a honey farm, Grape Seed Extract, Ascorbic Acid (Vitamin C), Natural Vitamin E, Grape Seed Oil, Alpha Lipoic Acid, NAC (N-AcetylCysteine), small amounts of Magnesium Stearate (non-caking agent from vitamin E) and rice flower.